A medium made a seemingly impressive guess about a hummingbird on a national television talk show. A follow-up investigation finds it not so striking after all—for the birds, in fact. I wish I had a nickel for every time I heard that from an amazed client of a psychic or medium. We skeptics spend a fair amount of time trying to understand and explain how mediums can appear to know details about people—living or dead—they’ve never met. It’s that last category that I want to tackle here, because it’s the accuracy of those specific guesses that seems to impress people most about mediums. But the question of accuracy can only be addressed when the guesser’s ammunition is known. A gun analogy may help illustrate this concept. Which is more impressive, hitting a target with a .22 caliber rifle, or a shotgun? Psychics and mediums use shotguns, and many carry gobs of shells. A blazing 12-gauge occasionally hitting a small target—say, a hummingbird—just isn’t that remarkable. I tried to explain this idea a couple of years ago on The Dr. Phil Show when Dr. Phil became impressed by a guess made by alleged medium Rebecca Rosen. Rosen is one of a relatively small number of mediums who command big bucks and have long waiting lists of eager customers. Dr. Phil’s experiment was to record video of Rosen and me each reading ten strangers in a small room at Paramount Studios. It was my first reading, while she had done thousands at that point. The next day, we shot the live show with an audience present. My goal was simply to show that even a green amateur like me could convince people I had psychic powers by using simple techniques. I believe I did—three of the ten sitters cried, which ironically gave me a great sense of relief because it meant I was convincing. Rebecca Rosen: I’m supposed to talk about a hummingbird . . .
RR: Nice! That’s from your guide. And your guide is saying the hummingbird’s your sign from me to know this is real and to know I’m with you. Dr. Phil: So Jim, what do you say about that? Dr. Phil: She goes to hummingbird. . . .Now come on, that’s a pretty random guess, if you’re talking about a guess. JU: Phil, if she would have said, “You’re the person who’s got a hummingbird tattoo,” then I would have been impressed. That’s not what happened. She said I’m getting a hummingbird. Dr. Phil: She was speaking directly to this woman. Listen, don’t set up a paper tiger (sic) and then tear it down. You know she was talking directly to that girl. JU: I don’t know how many guesses she made with that girl. She might have guessed 500 things . . .
Dr. Phil: Well, how many are you going to go through before you say hummingbird? Again, my next comment was edited out. But Phil was right. I had no way of knowing how many guesses she made. My cold reading of the ten people lasted about fifty minutes. I assume Rosen probably had a similar amount of time, but since only a few minutes of our readings aired, and they were highly edited, there was no way to know if Rebecca was using a shotgun or a .22. That episode aired in May of 2012. For a long time I wondered if Rebecca Rosen was a great cold reader, a prodigious guesser, or just lucky. 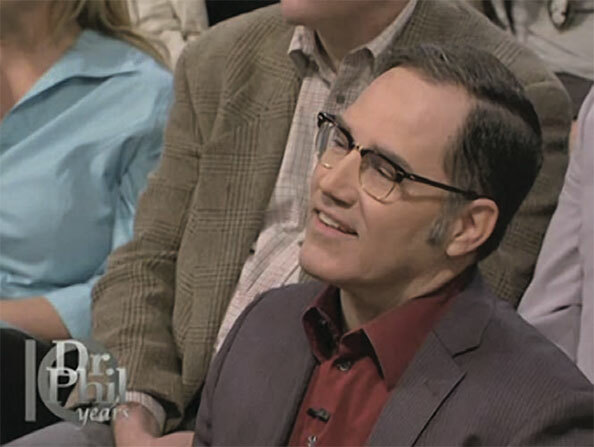 James Underdown on the Dr. Phil Show episode that psychic Rebecca Rosen appeared on. Then I got lucky. Someone I know—I’ll call her Lucille —paid $1,000 for a reading from Rebecca Rosen. Rosen’s rate (at that time) was $500 for a one-hour telephone reading, but the $500 rate meant getting in a year-long line. Lucille, who was grieving the sudden loss of her fifty-something-year-old husband, felt like she couldn’t wait, so she ponied up the grand. That’s just over $16.66/minute if you’re counting. Rosen includes a recording with every reading and Lucille loaned it to me for analysis. The first step toward analyzing the 59 minute and 7 second reading was to write out everything that was said. (Many thanks to Susan Gerbic for her invaluable help transcribing the recording.) I color-coded the entire reading so I could see how Rosen was spending her time. I wanted to know how many questions Rosen asked and how many guesses she made. The guesses were divided into two categories: 1. Statements she made that could be verified by Lucille or her family and friends. 2. Statements she made that concerned what the deceased or other “spirits” were up to during the reading. The full recording lasted 59:07, but Rosen actually spoke for only 45:45. The rest of the time consisted of Lucille or her two daughters speaking or of pauses. At that rate, she costs almost $22 a minute! During the nearly one-hour reading, Rosen asked 148 questions—about one every twenty-four seconds. The other 283 statements Rosen made concerned matters happening in the spiritual realm like “He’s jumping up and down” or “He’s telling me to tell you he shaved his beard off” or “He wants me to tell you guys that he has changed his name over there.” Conveniently for Rosen, there is no way to fact-check these kinds of declarations, but they still sound like communicating with the dead. There were thirty-nine more statements that were more like advice: “Yeah, so you’re asking how do I lose weight, simply cut that [sugar] out and you lose weight,” for example. RR: Is he [the living husband of one of the sitters] trying to start a new business? Answer: He has a lot of business ideas. RR: There is a lot that he’s like overwhelmed with. . . . They’re showing me his head’s spinning with the new work or taking on one more project. . . . The answer steered her toward a more believable follow-up guess. If the number of questions she asked was a surprise, the number of statements she made was astounding. Rosen’s total of 410 statements (one about every seven seconds) is where her expertise lies. Try making up a statement about someone (real or imagined) once every seven seconds and see if you can sustain that for even five minutes. This extraordinary number of guesses sheds new light on the “hits,” or accurate statements, that she got. By keeping the guesses flowing at a rapid pace, she greatly increases her overall chance at saying something significant to the sitter. It’s as clear an advantage as target shooting with a shotgun instead of a rifle. Apparently, mentioning hummingbirds (or birds in a general sense) pays off often enough to throw it out there. In the three examples of Rosen’s work I had access to, she tried hummingbird twice and a more generic bird reference the other time. Other repeat guesses included playing poker, jumping up and down, smiling, family pictures, someone named George, a dog, Rob or Bob, David, Dan, being pregnant, San Diego, April, and so on. By the way, augury—the practice of divining of the future by observation of natural phenomena like the behavior of birds—is millennia-old. We seem to notice the birds. Hell, I saw a hummingbird the other day. Which one of my many dead relatives was that? She didn’t know that. She asked lots of questions, made an extraordinary number of statements and some of them happened to mean something. Many—most, actually—meant nothing, were impossible to check, or were demonstrably wrong. And the onus of finding significance in any statement was on the sitter, who desperately hoped the contact with the dead loved one was real. It’s the perfect racket. Guess until you’re blue in the face and hope you touch a nerve. And if you don’t, just convince your high-paying clients your words will someday be meaningful. They’ll either keep searching until our random world turns a guess into a prophecy, or forget to even try. Either way, the check will have cleared. People pay mediums because the illusion of communicating with the dead taps all too well into our desires, our pattern-seeking, dot-connecting minds, and our heavy hearts. What do you really get for $1,000? An expedition (loaded with shotgun shells) hunting for the occasional hummingbird. Jim Underdown is executive director of the Center for Inquiry–Los Angeles, and the founder of the Independent Investigations Group.